Get back on your feet and return to your favorite activities with the orthopaedic services from Orthopaedic & Sports Medicine Center Of Miami PA in South Miami, Florida. Our orthopaedic specialties include everything from physical therapy to non-surgical procedures for patients of all ages. The benefits of working out are common knowledge to everyone. Staying in shape not only keeps you looking great, but it improves your mood, memory, and immune system. For many people, participating in a regular fitness regimen keeps them feeling focused and positive. At OSMC, we understand that no two bodies are built the same. Our staff of board certified physicians, physician assistants and physical therapists work personally with you to determine the best treatment plan for your needs. We get you back to your favorite activities in no time. Your body has a complex structure. Together, your bones, muscles, and organs must work together to keep you running. If one part is not strong enough, the rest of your body must work extra to make up for the problem. After Physical Therapy Athletes sometime require a transitional phase of strength training with a focus on their particular sport or activity. This is most commonly referred to as the Return To Play Phase. OSMC now offers just that! All of these while still in the confines of the Orthopaedic & Sports Medicine Center of Miami and availability to their Facility and Team of Board Certified Surgeons, Doctors, and Physicians Assistants. Swedish: The most common type of massage, designed to relax and energize you. Sport: to increase blood flow, range of motion, and assist in muscle recovery. Chair style: Quick treatments for the on the go patients. Designed to relieve stress and tension that lie. When you have to go under the knife for your treatment, let the physicians at Orthopaedic & Sports Medicine Center Of Miami PA in South Miami, Florida, take care of you. From reconstruction to repair surgery, we perform a range of surgical procedures for your condition. Many conditions can be fixed without the need for surgery. If your injury requires a special fix, our staff of board-certified physicians is here to help. We offer a number of options for your surgical procedures. If you watch football, you may have noticed a recent increase in the number of ACL tears. The anterior cruciate ligament (ACL) exists to keep your shinbone in place. When this ligament tears, your knee is at risk of giving out during activity. During reconstruction surgery, tissue from your body or a donor is used to repair your damaged ACL. After your new ligament is attached to the bone, your body will fill in new bone tunnels to keep the ACL in place. One of the most common injuries, a meniscus tear can be caused by any activity that causes you to twist or rotate your knee. In some situations, ice and rest can be enough to allow your injury to heal on its own. Oftentimes, surgery is required to take care of the problem. If your meniscus injury is too severe for a repair, surgery may not help. For these cases, our physicians perform a complete removal of your damaged meniscal cartilage, leaving a clean a redefined meniscus. As you age, you run the risk of suffering a torn rotator cuff. Because this injury can occur due to overuse, many people who have shoulder pain may not even realize that they have a tear. We perform surgery to repair this torn tendon in your shoulder. A tear to your labrum is an injury that requires surgery. Your labrum is a tissue that is attached to your shoulder socket to keep the ball of your join in place. While weightlifters typically experience this injury the most, it can also be caused by a fall. Shorter for “superior labral tear from anterior to posterior,” a SLAP tear is a common injury to the shoulder area. While [physical therapy] link to 8P can help improve your condition, surgery is required for a full repair. If you have ever suffered from a sprained ankle, you understand how severe the pain can be. We will meet with you to determine the best course of action to take for your injury. In some cases, ligament repair and reconstruction is required. For shoulder instability, the remplissage procedure may be the only solution. This surgery is designed to heal lesions within the Hill-Sachs. One of the most painful injuries for runners, football players, and other athletes affects the Achilles tendon. This tendon connects your calf muscle to the heel and aides with walking and running. Our physicians perform a full repair to heal your ruptured tendon and alleviate your pain. Runners and walkers are at high risk of developing patellofemoral, which is characterized by pain in the front of your knee. Whether you are wearing the wrong shoes or following improper form, this pain can be debilitating. Surgery to replace your kneecap joint may be required if other treatment plans don’t offer healing. Typically caused by falls, a separated shoulder or AC joint dislocation will not heal on its own if the injury is severe enough. Our physicians repair your ligaments to help your AC joint heal. Whether your fall caused a break to the bone on the inside or outside of your ankle, we perform a full repair. After surgery, healing can take between 6 to 12 weeks to complete. 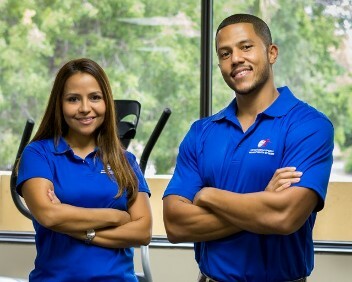 For personalized treatments for your sports injuries, visit us in South Miami, Florida. At Orthopaedic & Sports Medicine Center Of Miami PA, our staff of certified physical therapists, PT assistants, and athletic trainers are here to work one on one with you for any sports-related condition. For many injuries, surgery is seen as a final option. Most disorders can be improved with the right treatment plan. Our team of physical therapists meets with you on an individual basis for your services. We speak with you about your condition and conduct a thorough injury evaluation to determine the cause of your pain. After physical therapy, some athletes require a transitional phase of strength training to focus on the specific movements of their sport or activity. This “return to play” phase is a key part to the healing process. At OSMC, we tailor our program to meet your specific needs. Whether you need to work on your throwing mechanics, shoulder strengthening, speed, agility, or plyometrics, we get you back to peak condition. When your condition requires advanced therapy, turn to us at Orthopaedic & Sports Medicine Center Of Miami PA in South Florida. We offer a series of advanced therapy techniques that include a full assessment of your blood, nerves, bones, and muscles. Not every injury is caused by a break or tear. Some conditions are the natural result of aging, and some develop in your blood or nerve. No matter where you are feeling pain, our team of [physicians] link to 2P will work with you to find the proper solution. Our personalized treatment plans include ultrasound guided procedures and injections. Every condition is different. If you don’t have a break or a sprain, it can be difficult to pinpoint the exact cause of your pain. For these situations, diagnostic ultrasound is a powerful tool. This technology has grown in popularity in recent years. It provides our therapists with a clear image of your injury or condition. We use it to perform an accurate diagnosis. In addition to serving as a clear diagnostic tool, ultrasound is used as a way to decrease inflammation. Because the technology creates sound waves throughout your body, heat is produced in your affected area. This heat generates blood flow to areas to speed up healing. After a bone break, muscle tear, or tendon injury, the affected area starts to bleed. While bleeding is a natural result of any injury, it is also a natural way to have healing substances reach the right location. We use both platelet rich plasma (PRP) and tissue based pluripotent cells (TPC) to improve healing times and help your body recover naturally. As you age, your risk of osteoarthritis increases. This painful condition is caused by the breakdown of joint cartilage. Without this cartilage, your bones will begin to rub against each other, causing damage and pain. One of the most effective treatments for osteoarthritis is the use of intra-articular injections. These steroids are injected directly into the joint space, leading to reduced inflammation and pain. Treatment can also be used in tendons and ligaments in your joints. When you are forced to sit on the sideline while you recover, it may take you a certain length of time to resume your normal physical activities. Our physical therapy and sport specificity training program help your body remember specific movements and skills for your favorite sport. With our help, you’ll do more than just return to the field – you’ll be better than ever. Contact our board-certified physicians to schedule your visit with us for orthopaedic specialties and orthopaedic services in South Miami, Florida.